Our favorite family activity is CAMPING! We love the beauty of creation, especially inside our country’s national parks. Last summer we were able to visit 8 national parks on a 2 weeks adventure. Many of our campsites were primative, which meant I had to be a little creative with the cooking. 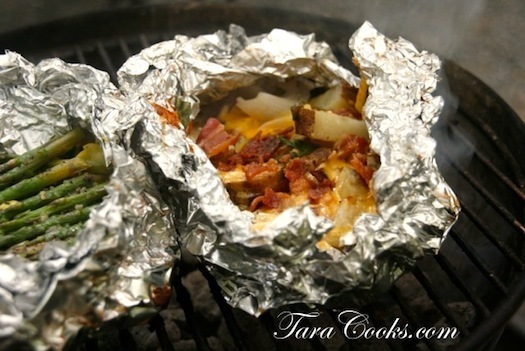 Campfire Loaded Baked Potatoes are easy and perfect side dish for a campout, a back yard BBQ or family reunion. This recipe is for 1 foil pouch which feeds approximately 2 people. The recipe can be doubled, tripled, or quadrupled to accomodate the number of guests who need to be fed. Thouroghly wash potatoes and slice into 1/4″ rounds. Arange potato slices flat sides down, in the middle of a piece of foil. I like to make a pile about 6-7″ in diameter. Next sprinkle potato with salt and pepper, papricka, or ground red pepper to suit your taste. Cut butter into thin pats, and arrange over top of potato pile. Top with shredded cheese, crumbled bacon, and chives. Bring 2 opposite ends of foil together and fold down then repeat with other sides of foil. I like to double wrap my potato pouches with a second layer of foil for extra protection while traveling. Also I want a tight seal to hold all the butter and flavors inside the pouch. Pouches can be stored in a cooler over ice in a Zip Lock bag for 2-3 days before cooking. Place pouches on a prepared grill and cook for 25-30 minutes or until potatoes are tender. Use care when opening steaming hot foil pouches. Oh my, those sound so good!